Chlamydomonas reinhardtii is an outstanding model genetic organism for study of assembly of cilia. 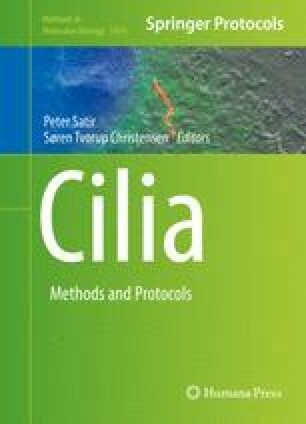 Here, methods are described for synchronization of ciliary regeneration in Chlamydomonas to analyze the sequence in which ciliary proteins assemble. In addition, the methods described allow analysis of the mechanisms involved in regulation of ciliary length, the proteins required for ciliary assembly, and the temporal expression of genes encoding ciliary proteins. Ultimately, these methods can contribute to discovery of conserved genes that when defective lead to abnormal ciliary assembly and human disease. This work was supported by grants from the NIH (GM051173, WSS; Training Grant K12 GM000680, LMA; Training Grant 5T32 GM00836725, ELH) and the American Heart Association (14PRE19510013, ELH).